Yakutian theatre-goers applaud Kuttiyattam performances at the Masterpieces of UNESCO in Olonkho Land Festival. Tens of thousands of kilometres away from the backwaters of Kerala, Kuttiyattam performers from the southern Indian state staged performances of the Sanskrit theatre in the Russian Republic of Sakha (Yakutia). The theatre-group was in the Russian internal republic for the ‘Masterpieces of UNESCO in Olonkho Land Festival’ that was held on July 10-16. The festival was held alongside the Children of Asia sports tournament that brought together under-16 athletes from across the continent. The Indian artists were joined by performers from Indonesia, Bhutan, South Korea, China and Japan as well as groups from the Asian part of Russia. The festival, which carried the same motto as the games, “From Friendship in Sport to Peace on Earth,” focussed on showcasing various Asian cultures to the people of Yakutia. The second edition of the UNESCO festival was marked with greater fervour as the cultural wing of the United Nations announced that the Lena Pillars Nature Park was designated a World Heritage Site. The park is famous for its natural rock pillars that reach a stunning height of about 100 metres along the banks of the Lena River in the heart of the internal Russian republic. The pillars were produced by Sakha’s extreme continental climate with an annual temperature range that goes from 60 degrees below zero Celsius in the winter to 40 degrees above freezing point in the summers. Crowds thronged to several venues in the city of Yakutsk, including the prestigious State Opera and Ballet Theatre and the P.A. Oyunski Academic Theatre, to watch the Asian dances. 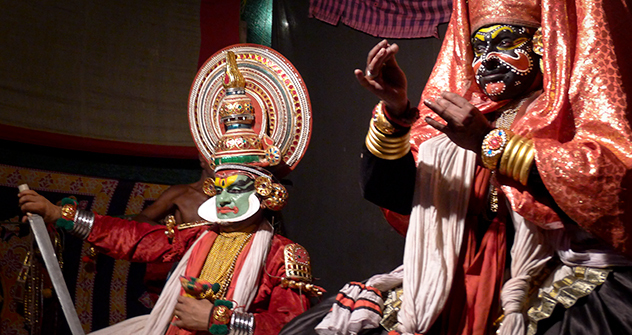 The festival, which had performances from 13 countries, was inaugurated with a Kuttiyattam performance. The Yakutian Olonkho Theatre, representing the host republic, staged a theatrical performance of the unique Sakha epos, Olonkho. Many members of the knowledgeable Sakha crowd had a basic idea of some of the dances and showed a great deal of appreciation for the traditional music, dances and theatre performances that have been passed down through generations. Many parts of the folk art on display were passed down orally without any written record. Kutiyattam is traditionally performed in Hindu Temples in Kerala in the Sanskrit language and is about 2,000 years old. Since Sakha doesn’t have a Hindu temple, a jam-packed Yakutsk State Opera and Ballet Theatre hosted the performances. The audience was stunned by the power of expression displayed by the actors portraying Lord Rama, Ravana and his wife princess Mandodari. The performers managed to convey all the intricate emotions by their subtle mimicking and singing accompanied by exquisite drumbeats. Yakutians were also mesmerized by the improvisation of the troupe and the perfect synergy between the drummers and actors. The colourful ethnic costumes and the complicated make-up intensified the awe among the viewers, who were hooked on the acting and music. After the echo of the last drumbeats faded away, the viewers rose from their seats to give a standing ovation that lasted for several minutes. Judging by the public reaction, many members of the audience were in a spell long after the performance ended.